The four independent principals of Coop Water House utilize individual skill sets in regards to water architecture. The collaboration draws together the experience and respective qualifications of each team member and utilizes these respectively for the task at hand as well as the resulting requirements. In addition to her job as an architect Amelie Rost is also an assistant professor for Conceptional Design and Building Theory at the HafenCity University Hamburg and does research work regarding the possibilities of floating architecture in the urban development of metropolitan regions. Jörg Niderehe is specialized in the construction and realization of projects and holds an additional degree in the field of fire protection planning. 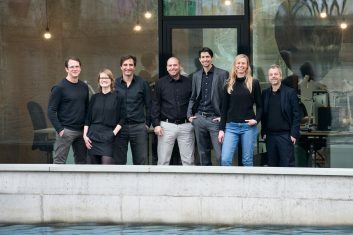 The office of sprenger von der lippe is regionally and internationally active in the classical fields of architecture including residential, office and retail architecture and specialized in the fields of zoo, cinematic and water architecture. The office principals Richard Sprenger and Oliver von der Lippe view design as a process at the end of which a clear holistic concept stands that integrates a convincing design, functionality, and economic viability. The principals lead their clients through all design phases and coordinating processes. The focus of Tommy Müller’s and Nathalie Dudda’s work lies in the development and design of floating architecture up to an including its realization. In addition to their office activities, both can call upon a wealth of professional practice in notable Hamburger architecture offices. Tommy Müller consequently continues to pursue the high demands of good design in the planning of house boats and the revitalization of existing house-barges. Nathalie Dudda facilitates the planning process and is responsible for the cost and calculations, construction management as well as project management. In addition to the design and technical aspects of the house boat planning, Daniel Wichersheim also occupies himself with the thermal building physics (thermal insulation), energy efficient building methods with regenerative building systems for heating and hot water and the use of ecological building materials for house boats.